We recently revealed some of the posters that have adorned London's transport system for more than 100 years. Here's more from the women who have shaped the way people see the city. Female graphic designers have been producing artwork for the Underground since 1910, yet many remain largely unrecognised. Some of their work was published under the name of an advertising agency, others were unsigned, and more still simply used their initials. The Poster Girls exhibition at the London Transport Museum is showcasing the pieces. Unlike many of the designers, Mabel Lucie Attwell was a well-known illustrator, famous for her wide-eyed depictions of children. 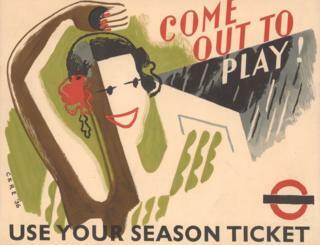 The Underground Group started to use her designs to advertise specific events at off-peak times, such as pantomimes. A 1912 poster advertising a country fair to raise money for an animal charity is one of the earliest uses of a female artist on the underground. A butcher's daughter, Attwell was born in 1879 - the ninth of 10 children. She never finished formal education, yet the first pictures she gave an agent sold overnight. 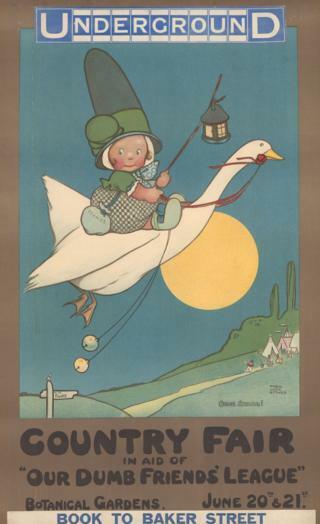 By 1911 she was producing hugely popular postcards and greetings cards featuring chubby toddlers based on her daughter Peggy. Working in watercolour and ink, she was a commercial success, although her work was looked down upon by some critics for "sentimentalising" childhood. 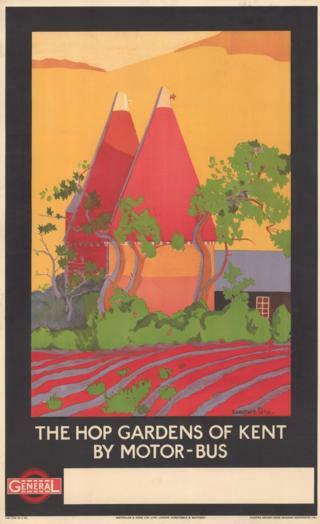 The Dorothy Dix work, The Hop Gardens of Kent, was used in 1922 to promote travel to the country by bus. The image depicts an oast house on a hop farm - a familiar sight in the Kent countryside. She was an accomplished painter and exhibited two paintings at the Royal Academy Summer Exhibition; Evening in a Cotswold village (1931) and Winter cheer (1947). Mary Koop was the designer of the 1925 artwork Summer Sales Quickly Reached. Little is known of Koop, other than that she studied at the Croydon School of Art and the London School of Art. 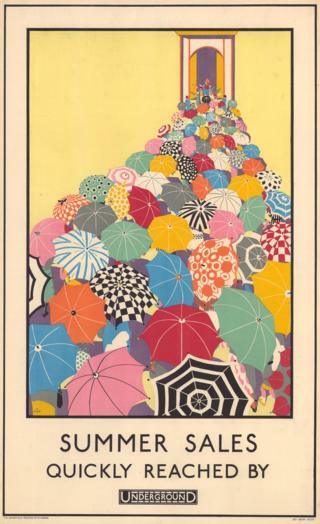 A print of her torrent of umbrellas sold in 2012 for nearly £9,000, and the image has been widely reproduced, including on real umbrellas and postage stamps. Arnrid Banniza Johnston was Swedish by birth and the daughter of a corn and grain merchant. She first made her name as a sculptor, before branching out into poster design. 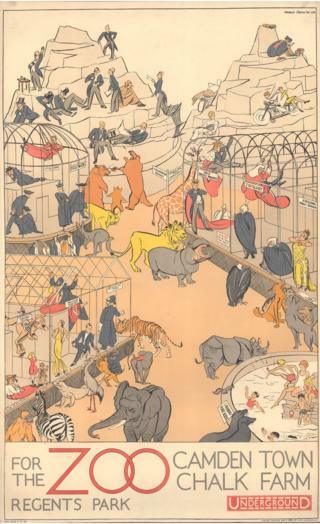 Her 1930 Regents Park zoo poster, which switches the role of animals and spectators, was meticulously researched and led her into the book illustrating industry. She died in 1972, and one obituary said of her: "Her many friends found her robust generous personality as characterful as her animals". Anna Katrina Zinkeisen and her sister Doris were privately educated at home before they both won scholarships to the Royal Academy Schools. In 1935, they were commissioned by the Clydebank shipbuilders John Brown and Company to paint murals on the ocean liner RMS Queen Mary. Their work can still be seen, in the Verandah Grill room, on the ship now permanently moored in Long Beach, California. 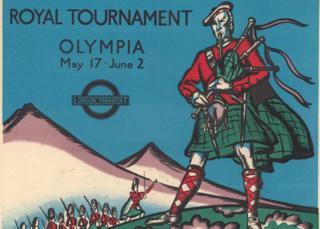 Anna was also working on illustrations for books and magazine covers as well as designing posters, such as a promotion for the Royal Tournament at Olympia. During World War Two she worked as a medical artist and nursing auxiliary at St. Mary's Hospital, Paddington. After completing a day's shift working on a ward as a casualty nurse, Zinkeisen would use a disused operating theatre as her studio to work on her paintings. 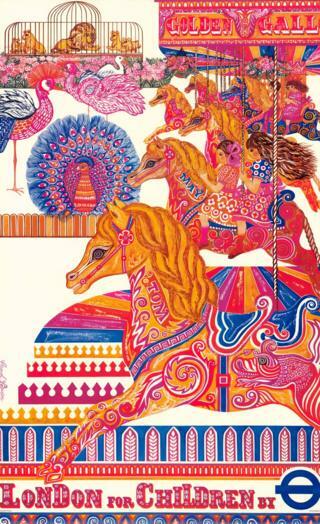 Carol Barker's psychedelic London for Children poster was used in 1973. Barker used a variety of techniques and media in her works, including combining fragments of clothes, vintage photographs and knitted lace to create a nostalgic scrapbook image of London's past. She also illustrated children's books - H. E. Bates wrote the text of Achilles the Donkey specifically to go with her images. 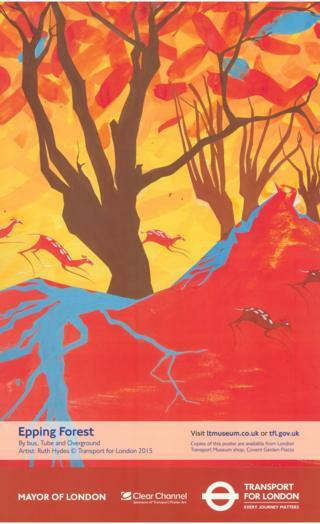 Ruth Hydes' poster for Epping Forest echoes earlier images designed to tempt Londoners out of the city and was part of a set she designed in 2015 celebrating London's open spaces. She said she is inspired by "buildings, colour, pattern, random objects and natural history". The exhibition is on until January 2019.